Candu Energy has signed an agreement with three China National Nuclear Corporation (CNNC) subsidiaries to expand their cooperation in the development of thorium and recycled uranium as alternative fuels for new Candu reactors. 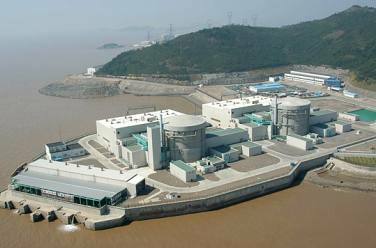 The Canadian company has agreed with the Third Qinshan Nuclear Power Company, China North Nuclear Fuel Corporation and the Nuclear Power Institute of China to expand their joint project to demonstrate the use of fuel bundles containing recovered uranium from used fuel at CNNC's existing Candu pressurized heavy-water reactors at the Qinshan plant in Zhejiang province. The agreement, which will run for two years, is expected to result in a detailed conceptual design of the Advanced Fuel Candu Reactor (AFCR), which Candu describes as "a further evolution of the successful Candu 6 and Generation III Enhanced Candu 6, which is optimized for use of recycled uranium and thorium fuel." Candu's senior vice president of marketing and business development Ala Alizadeh said, "At the completion of the agreement, we expect to have the basis of a pre-project agreement for two AFCR units in China, including site allocation and the definition of the licensing basis." The agreement, Candu said, marks the third phase of cooperation that started in 2008 between Canada and China to demonstrate not only the use of recovered uranium but also thorium in Candu reactors. In November 2008, the four partners announced that they would jointly develop the technology for the use of uranium recovered from used nuclear fuel from other Chinese reactors for use at Qinshan 3 and 4. The partners signed a further agreement July 2009 to jointly develop and demonstrate the use of thorium fuel and to study the commercial and technical feasibility of its full-scale use in Candu units. In March 2010, the partners reported that fuel bundles containing recovered uranium from used fuel had been inserted into Qinshan Phase III unit 1 at the start of a one-year trial. Candu said that those tests demonstrated the feasibility of using natural uranium equivalent (NUE) fuel, composed of recycled uranium and depleted uranium. Two 728 MWe Candu 6 units are in operation at the Qinshan Phase III plant. "The parties are now working on a project to convert the Qinshan Candu reactor units to full core use of NUE fuel by 2014," Candu said. Frank Yee, Candu's chief nuclear engineer, commented, "China has abundant thorium resources, and can use recycled uranium in the most efficient and cost effective manner in our commercially proven reactor designs with minimal changes."